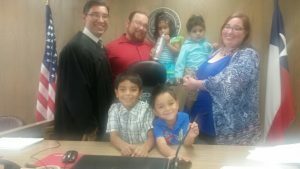 Congratulations on the Cortez Adoption! We are so proud to say that we have completed yet another adoption! Every day we see these people come together and become a family brings a smile to our faces. This is our job, and sometimes it is difficult, but seeing these kids so happy always makes it worth it. This is why we do this. Congrats on the Cortez adoption!